Sponsor 2019 Oregon Life Science Genealogy now! Do you want to help promote Oregon's life science industry? Do you want to increase your company's or organization's visibility? If so, then you don't want to pass up sponsoring the new 2019 Oregon Life Science Genealogy poster. Oregon Life Science Genealogy, last published in 2008, is a one-of-a-kind image that illustrates the founding technology origins of more than 160 life science companies located in the state. Specifically, the origins of the companies' founding technology with the state's universities and non-profit research organizations -- longstanding centers of innovation, technology transfer and job creation. The poster also includes the addition of more than forty new companies and the loss of more than a dozen companies to acquisition, consolidation and dissolution. Please note the poster includes additions, deletions, corrections and suggestions received from numerous companies and technology transfer offices over the last year. We thank all for taking the time to provide their valuable feedback, insights and suggestions. Importantly, the Oregon and other posters are now maintained in a rapidly growing database that allow easy updating. Changes to company and organization listings on the posters can be sent to: Suggestions@InfoResource.org. The printed posters will be distributed to all companies in the state of Oregon, with digital poster distributed to more than 6,000 companies throughout the U.S. and Canada including senior executives and management, VC firms, analysts, brokers, technology transfer officers, scientists, legislators, media, service sector, educators and others. 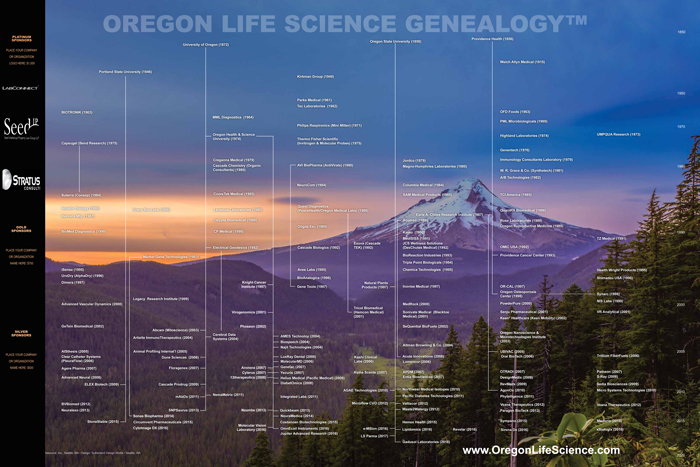 Distribution of the Oregon Life Science Genealogy and other posters will begin in the spring of 2019. If you want to sponsor the new Oregon Life Science Genealogy poster, please e-mail: Sponsor@InfoResource.org specifying the sponsorship level you desire along with the billing contact name, mailing address, phone number, and contact e-mail. Oregon Life Science Genealogy(TM) 2019 © Info.Resource, Inc.